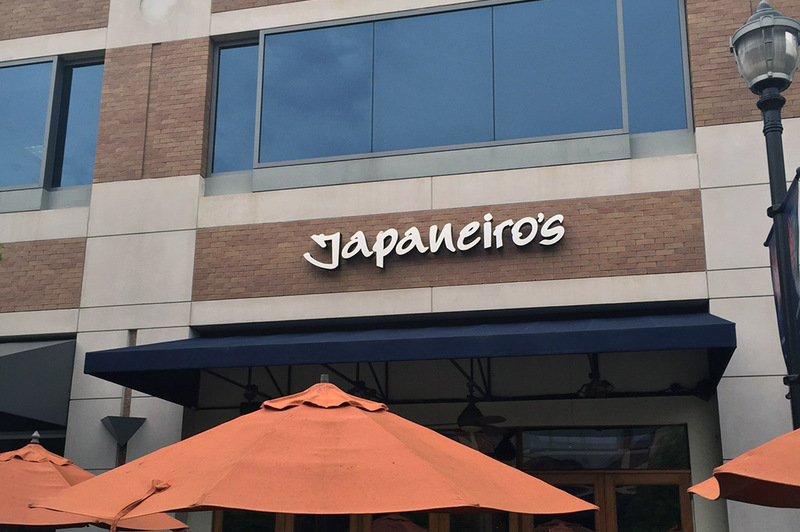 Japaneiro’s sits nicely in the Town Square Plaza in Sugar Land. It was one of the first restaurants in the plaza and from the beginning it has been putting smiles on every mouth comes through the door! When we reach out to you (our subscribers), we get a lot of great feedback on who you believe should be awarded the Good Eats Houston certification. Of course, we do our own due diligence and qualify all restaurants by visiting them for a review before officially certifying them on our Good Eats Houston restaurant directory. To-date, japaneiro’s has received more recommendations from our subscribers than any other restaurant in Houston. Now, that tells you something! Let’s just say we were pretty excited to finally get a taste of some of that Japanese-Latin fusion we have been hearing such great things about. Right off the bat, you know that you will be served the unique and vibrant flavors only Japanese-Latin fusion can deliver. It’s almost like being in two different restaurants with certain menu items sharing the bill. As you walk up to the entrance, you’ll see a shady spot with several outside tables; the perfect place for a happy hour or casual lunch with friends. This bustling area of the plaza is also a great place to sit and people watch. As you enter japaneiro’s, you get a full view of the whole layout. They have done a great job, providing different dining areas and a décor that is as bright and colorful as the cuisine. Apart from the outside patio mentioned above, the restaurant has a bar with high tops all around. This section is divided into various booths and sit-down tables, big and small. Finally, you have your traditional sushi bar towards the back. So, we started off with a couple of Japanese craft beers as we looked over the extensive menu of goodies. We ordered a Wabi-Sabi IPA or a JPA (Japanese Pale Ale); a very tasty brew containing green tea and wasabi. I highly recommend you give it a try. For starters, we ordered two different soups. First, we sampled the Seafood Chupe: a delicate, Andean-style soup with crab meat, shrimp, salmon and a selection of fine herbs and peppers. The Avocado Cream Soup, served warm and equally delicious, consisted of silky avocado-cilantro cream topped with kani and freshly sliced avocado – a perfect choice for vegetarians. Along with our soups, we ordered the Tajadas: soft and sweet fried fresh plantain slices served with a side of nata cream. I love plantains and the nata cream combined with the sweetness of the plantain made this a great choice to start the meal. We were already starting off with flavors you just can’t get every day. To begin our journey into the two different cultures, we decided to try a couple specialty cocktails: the Mojito and the Pear Martini. I would have loved to sample every one off the list, these two were so flavorful. I always enjoy a great fresh Mojito. The Pear Martini isn’t something I’d usually order, but it went perfectly with the fried plantains. Instant hit! I let my co-pilot order for us when it came to the Japanese-influenced portion as he’s the expert in this type of cuisine. We started off with the Caribbean Volcano: a warm bed of sweet plantains covered with the freshest spiced tuna, topped with avocado, a miso reduction, coconut milk and sesame seeds. This dish was incredible and a must try! It was beautifully presented, as you can see in the photography, and the flavor combination was amazing. I will definitely be back and when I do, this beautiful volcano will be here just waiting to erupt. Next, we ordered a small sampler and a medium nirvana. The small sampler is a great way to enjoy a variety of different menu items and I enjoyed every bite. From left to right in the photography, you can see: the Toro (fatty tuna), Uni (sea urchin), escolar (super white tuna), Tamago (a sweet omelet) and Ikura (salmon roe). All the fish was very fresh and absolutely delicious! I decided to lay off dipping them in soy or wasabi to receive the true flavor profiles of each one. The nirvana is a beautiful presentation that sits in the middle of table for everyone to admire and enjoy! It comes in three sizes – medium, large and huge. You can order it however you like or let the chef decide, which is what I recommend because that way you might try something new and enjoyable that you might not have thought to order otherwise. My personal favorite was the Green Albacore, a delightful combination of shrimp tempura, avocado, jalapeno & spicy mayo topped with kani, baked albacore, fresh salmon, ponzu sauce, sriracha, cilantro and unagi sauce. What a fantastic roll! We also enjoyed the Super Dave, a spicy roll a number of our subscribers had suggested. It consisted of spicy yellow tail, cilantro and avocado wrapped in soy paper and topped with fresh tuna, sliced fresh jalapeno and yuzu sauce. The freshest yellowtail available and just the right amount of spice makes this dish a fan favorite as well as one of mine! Now for some of that Latin flair I love so much! We ordered the Churrasco (my mouth started watering as I typed that). One of my favorites dishes, this exquisite South American-style, certified Angus tenderloin was marinated in chimichurri (another flavor I can’t get enough of) and grilled to perfection so it almost melts in your mouth! It was served with roasted garlic mashed potatoes and sweet plantain slices. I enjoy steak and this one had such a unique and excellent flavor that I regret not ordering another one to go. Ha! We ordered the Seafood Rice to enjoy with the steak and this was really a meal in itself! This dish was a delectable medley of stir-fried rice with shrimp, salmon, vegetables, herbs and spices, and topped with the lovely sweet plantain slices I have come to enjoy so much here at japaneiro’s. Delicious and flavorful, this combo is a great choice for a quick lunch! Japaneiro’s has a number of desserts that piqued my interest. Today, I headed deep into my State Fair roots and dove into the Oreo Tempura: Oreo cookies dipped in tempura batter, then deep fried and served with delicious vanilla ice cream. What a wonderful ending to a unique and beautiful meal! It’s no wonder japaneiro’s has won a number of awards for their fine cuisine. Theirs is right up there with the best sushi I have ever tasted, and, having spent the last 10 years in Southern California, that is saying a lot! Japaneiro’s is the type of restaurant that should be visited no less than a couple of times a month -maybe even a couple of times a week if you throw in a few happy hours at the bar! I now have another go-to restaurant in the Sugar Land Town Square Plaza. If you haven’t experienced Japanese-Latin fusion, I highly suggest you drop everything and head over to japaneiro’s… you are in for a treat!